The data you see in the sensor message is not necessarily the current data. It merely shows the reason for the current status and why the sensor changed to it. This means for the Up status, for example, that this data is as old as time has past since the last alarm disappeared. Note: Names of configured alarms that you want to monitor must not contain double spaces. Note: Amazon will charge you (a small amount) for each "Amazon CloudWatch API Request" query the sensor sends to the Amazon servers. For details, please see the Knowledge Base: How much does Amazon charge for using the CloudWatch API? 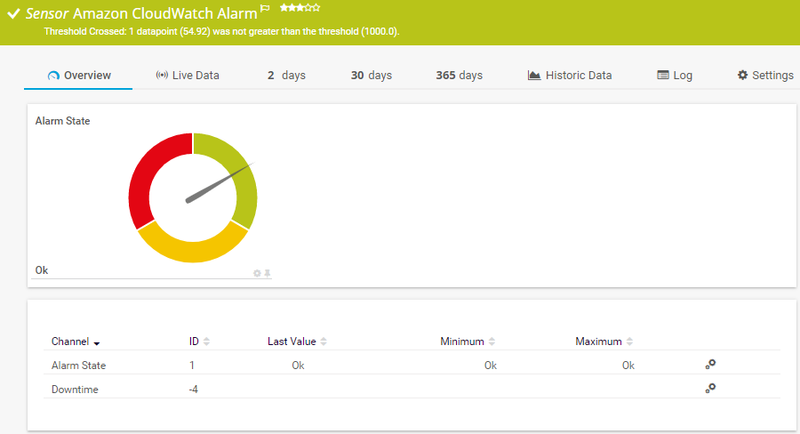 Select which alarm(s) you want to monitor. PRTG creates one sensor for each alarm you choose in the Add Sensor dialog. The settings you choose in this dialog are valid for all of the sensors that are created. Select the alarms you want to add a sensor for. You see a list with the names of all items which are available to monitor. Select the desired items by adding check marks in front of the respective lines. PRTG creates one sensor for each selection. You can also select and deselect all items by using the check box in the table head.